For anyone who’s been following my blog since the beginning (are you still out there…. anyone?? 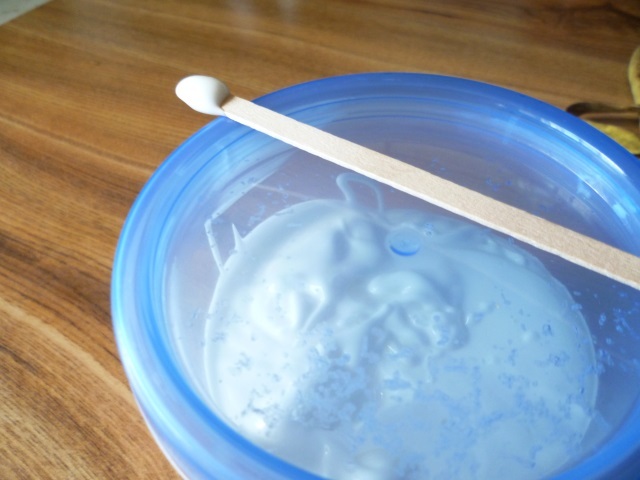 ), you may remember that I used to make all my own creams and lotions. Since we first moved into an apartment that didn’t have a dishwasher, I haven’t made any, partially because of the fact that a dishwasher is great for cleaning up oily dishes and the fact that we just don’t have the room. However, I’m getting tired of being disappointed with commercial creams and hand lotions. So, I’m going back to what I used to do. I still have some of my supplies from way back then (we’re talking ten years here, people! ), things that don’t go bad… like beeswax. Oils are readily available so I’ve used a combination of rice bran oil, avocado oil, and sweet almond oil to make Rosemary Gladstar’s Perfect Cream (an excellent article, by the way). For a light scent, I added 7 drops each of ylang ylang and lemongrass. This cream is a little greasy when it first goes on but does absorb fairly quickly. Truly, for my face, this is more than enough. As for my adventures in soapmaking this weekend, the Peppermint Soap…. well, I’m not calling it a failure and I’m not calling it a success. It was a definite learning experience. 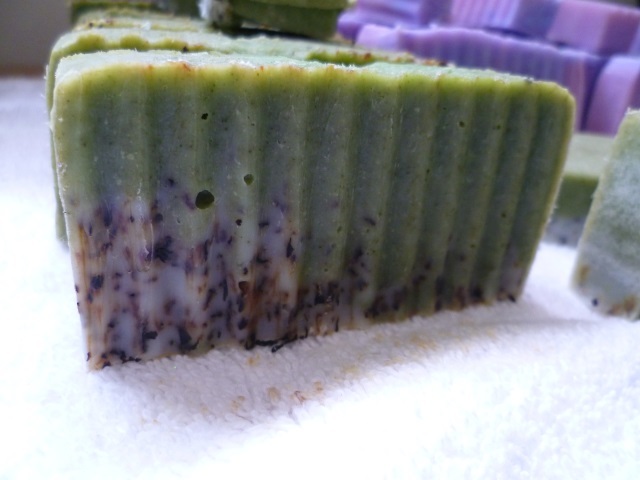 Botanicals (plant matter) in soaps are not really a great idea. This soap is taking forever to firm up. There’s still one mold that’s too soft to unmold but I think it’s because the mold is hard plastic; it just doesn’t breathe. I may need to pop it into the freezer for a while. I cut the loaf of soap after we got home from the fair last night but it really should have sat for another day or so; it was a bit mushy. Today, however, it has firmed up somewhat so I think that, in time, it will be alright. Now, time to relax and do some knitting and continue listening to an audiobook – right now, it’s The Hitchhiker’s Guide to the Galaxy.